Check out our guests reviews of Highland Airs! We loved it!!!! Took a day trip with the kids after reading another review about how great this was for kids. Drove out from Manhattan and we're so glad we did. We did the halter training and the kids (half the size of the alpacas) had an amazing time, they walked them around and became very comfortable with them; they didn't want to leave and can't wait to go back. We certainly will as this was an easy ride from the city just a little over an hour. The animals are so good with kids, they even seemed to have as much fun as the kids did and you could see both the kids and the alpacas warm up to each other. Andrew gave us the halter training and a plethora of information about the alpacas. Even insight into the bobble-head look and the alpaca farm industry, other staff members were also very friendly and helpful. 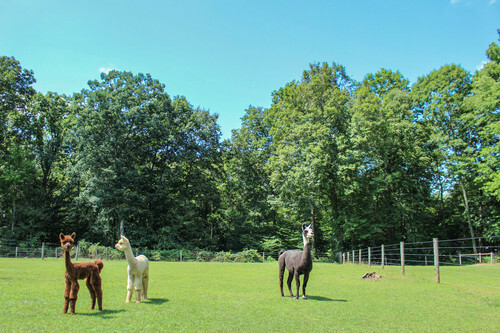 If you're looking for a place for kids or even yourself to interact with alpacas, this is it. There were kids of all ages there, mine being 12,12 &14 (older than most of the kids we saw that day) and all loved it. They had a Llama that was also very friendly and loved being fed. Highly recommended if you're looking for an alpaca experience. 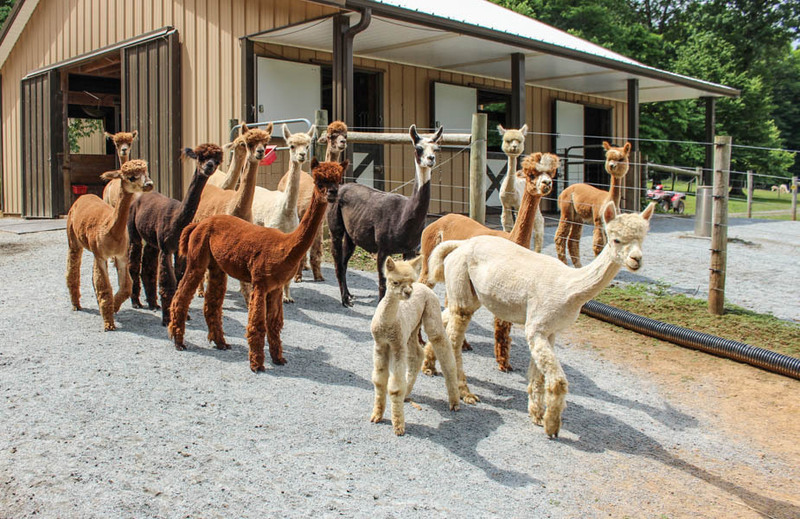 This was our first alpaca farm and they couldn't have done it any better. So glad we went. My friend and I did the halter training--where you can put a harness on an alpaca and walk him/her around--today with Andrew, the farm manager. It was a fantastic experience. Andrew and the couple that owns the ranch are all very friendly and very informative; they were extremely accommodating and made the whole experience extremely enjoyable. 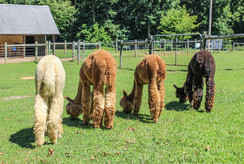 The alpacas are adorable and very gentle, and so fun to feed, pet, and be around. As found on Trip Advisor! This was a quirky little plan to picnic with the alpacas and it ended up being an absolutely delightful afternoon. We arrived at the ranch and were greeted by Colin, a full time pulmonologist and alpaca farmer. He was charming, informative and very generous with his time. 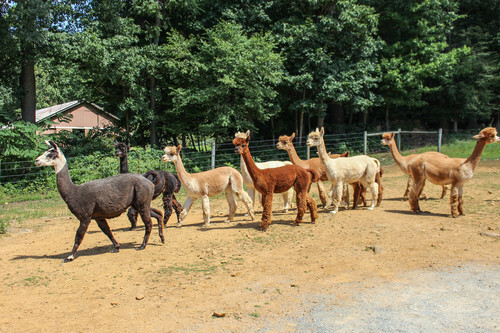 He began the tour brought right into a swarm of gentle alpacas. Incredibly soft to the touch, friendly (and hungry) they ate from our hands. Colin then turned us over to his wife (a COO of a health care concern) who is clearly the driver of the operation. We got an in depth introduction to these amazing animals. It was fun, educational and very entertaining. There is no charge for the visit or tour! Colin and Joy are dedicated to raising awareness about alpacas. They have a small gift shop, so plan on dropping a few dollars on some alpaca socks and such. We packed a picnic lunch and had it on their property down by the Musconetcong river. Just lovely. My boyfriend and I visited the farm last year and absolutely loved it! First of all, the grounds are gorgeous. The ranch is immaculate, and the animals are well-kept and beautiful. Just a word to the wise - there is a good chance that visiting may make you desperately want to quit your day job and move away from the city to play with Alpacas all day. Please don't say I didn't warn you. About the farm: The owners were incredibly lovely and gracious, and not only did they give us a ton of information about Alpacas but they also let us spend time with them inside the fence and barn. My boyfriend had visited Alpaca farms before and told me that the other places didn't let you interact with the animals so spending time with them and being allowed to pet them definitely made the visit very memorable. We loved that the owners treat all the Alpacas like family members which makes the animals very social and sweet. One of the younger ones kept snuggling up to me like a little dog and for some moments I contemplated ways to convince my landlord to keep an Alpaca in my Brooklyn apartment (yes, they are that cute). All around a great experience at this wonderful farm. They also have a great little store where they sell a lot of beautiful Alpaca products, from sweaters to hats and gloves, to ornaments and mugs. Just check the farm schedule before you go, they're usually only open on the weekends. So what are you waiting for? 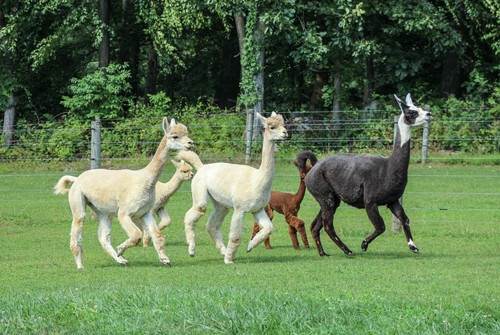 Go frolic with some adorable Alpacas already! I took my two grandsons yesterday. We had so much fun and enjoyed every minute of the tour. The boys also got an amazing lesson on how to put a halter on an alpaca and walk with them. It was just wonderful seeing these young boys put down their tablets and Ipods and spend a beautiful day with these incredible alpacas. Thanks Andrew for making our summer! We'll definitely be back! What a wonderful experience visiting here! The owner himself gave us an amazing free tour, introduced us everything about alpacas and lamas, and answered every question that we are interested. He is so nice and warm hearted that we feel really welcome here. You could not only take a close look at alpacas, but more excitingly, play with them! You could feed and touch their heads and necks and they are so good to keep company. We also love the gift shop here with all the cuties made of 100% alpaca fiber, super soft and fluffy!Best farm tour ever! The staff is friendly, gracious and informative. Beautiful, and some even cuddly, alpacas here! I love my alpaca blend blanket and having some of the alpaca sniff it cautiously was so cute! So much fun to feed them and pet them!